In the market for new insulation? Use this guide to determine the type of insulation that's right for you, creating a more comfortable and energy-efficient home. 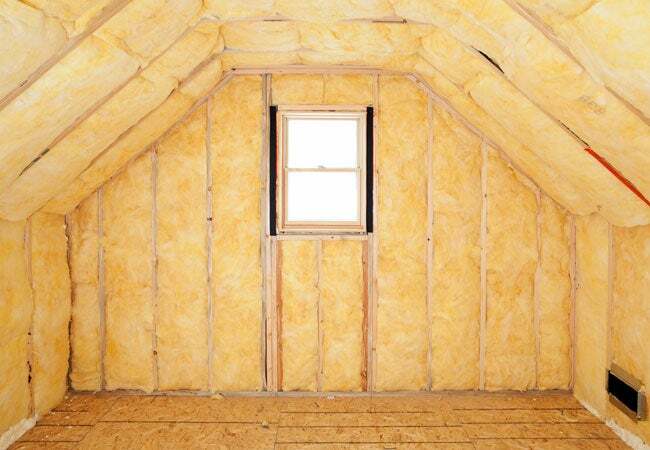 Insulation is a vital component in any home that aims to be energy-efficient. Typically placed in areas where air escapes, such as between the stud cavities inside the walls and in the attic, it serves to slow and reduce heat transfer. By sealing air leaks and adding proper insulation to the attic, crawl spaces, and basement, homeowners stand to save an average of 15 percent on heating and cooling costs—11 percent on total energy costs—estimates the U.S. Environmental Protection Agency’s ENERGY STAR program. For the typical homeowner, this translates to about $200 pocketed year after year. Still, approximately 90 percent of single-family homes in the U.S. do not have sufficient insulation, according to 2015 research by the North American Insulation Manufacturers Association. Not only does poor insulation waste energy and increase energy bills for these buildings, it also disrupts your family’s comfort level by allowing drafts and offers little barrier to your home’s CO2 emissions. Before you rush to the home center to inquire about insulation or hire a contractor for installation, it’s important to understand the basics. Not all insulation is created equal, and various types exist for different applications. Here, we outline the details of five major options: blanket batts and rolls, spray foam insulation, blown-in insulation, foam board or rigid foam panels, and reflective or radiant barriers. Note: As you carefully weigh each of these options to determine which (or which combination) best works for your home, carefully consider a product’s R-value, which is a measurement of resistance to heat flow. The higher the R-value, the better the insulation is at reducing energy loss. Consumers can typically find the R-value on the product packaging; check out this chart by ENERGY STAR to learn more about the measurement. Blanket batts and rolls are typically constructed with fiberglass, although versions made of cotton, mineral wool, and plastic fibers are also available. 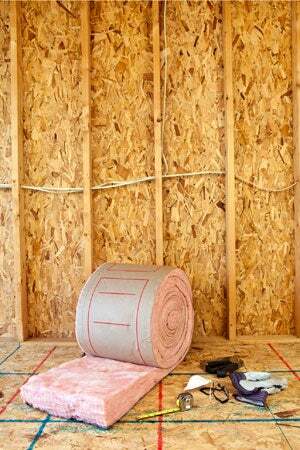 Installing this type of insulation is an inexpensive and DIY-friendly project, since the materials are designed to fit into the standard width between wall studs, attic rafters, and floor joists. (Pro tip: Keep in mind that fiberglass is a lung and skin irritant, so always wear protective clothing when handling the material.) If you opt for the roll variety, you’ll need to cut the insulation to the proper length with a utility knife; forcing the insulation to fit by compression makes it less effective. Standard fiberglass blankets and batts have R-values between R-2.9 and R-3.8 per inch of thickness. High-performance (medium-density and high-density) fiberglass blankets and batts have R-values between R-3.7 and R-4.3 per inch of thickness. Spray foam insulation seals leaks and gaps inside existing walls. Liquid polyurethane is sprayed into the cavity of the wall, where it then expands and hardens into a solid foam. When insulating a larger area, homeowners can use a pressure sprayed (foamed-in-place) option. 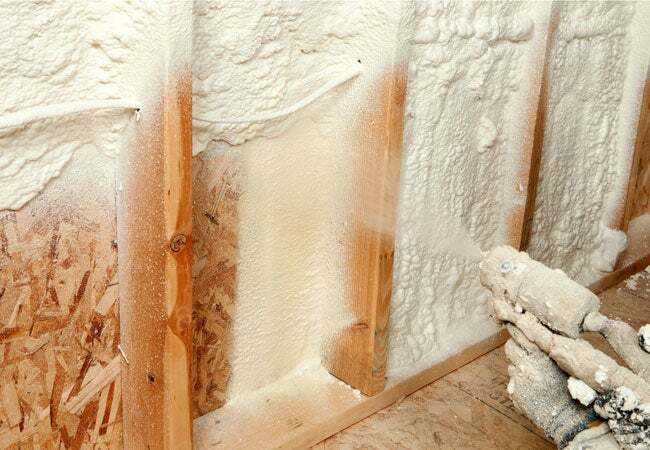 Spray foam comes in two constructions: open-cell foam or denser closed-cell foam. 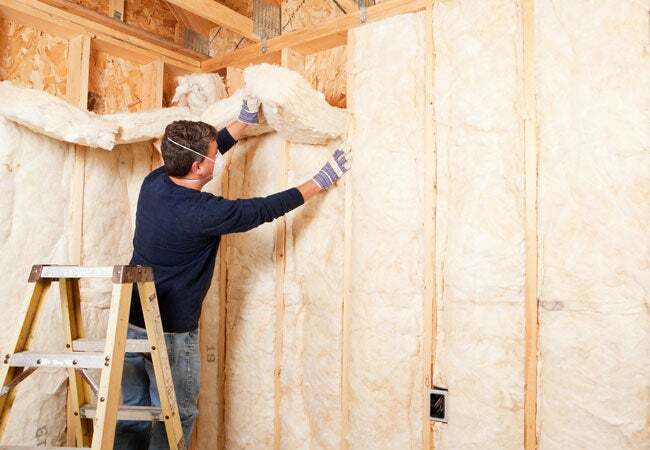 Closed cell foam has the highest R-value of any insulation, around R-6.2 per inch, but can be expensive; open-cell foam insulation values are around R-3.7 per inch of thickness. If you choose spray foam installation to increase the R-value of their home’s insulation, consider calling a professional for the job, since installation can be trickier than simply aiming and spraying. Blown-in insulation is applied using a machine that blows a paper-like material into the space to be insulated. This type of insulation is often made of fiberglass, rock wool, or reclaimed cellulose material (like recycled newspapers or cardboard), which conform to fit nearly any type of location—even the peskiest obstructions. For blown-in insulation, R-values range from R-2.2 for fiberglass up to R-3.8 for dense cellulose. Simple insulation jobs may be DIY-friendly if you rent an insulation blower, but consider calling a professional for best results. Whether you want to insulate a floor or an unvented low-slope roof, foam boards and rigid foam panels can get the job done. They reduce the amount of heat conducted through wood, wall studs, and other elements that make up a home’s structure. Homeowners rely on this type of insulation—which is usually made of polyurethane, polystyrene, or polyisocyanurate—for both exterior and interior wall sheathing. Foam boards work well to insulate everything from foundation walls and basement walls to unfinished floors and ceilings. R-values typically vary between R-4 and R-6.5 per inch of thickness, indicating that foam boards and rigid foam panels reduce energy consumption better than many other types of insulation on the market. Reflective or radiant barriers work differently than most types of insulation, and so its effectiveness is not measured by R-values. While standard insulation reduces heat flow in a home, reflective insulation instead reflects the heat away from the home to prevent heat gain and radiant heat transfer to cooler surfaces indoors. The insulation is constructed using a reflective barrier (like aluminum foil) placed over a substrate material (like kraft paper or polyethylene bubbles). Homeowners in warmer climates typically place reflective or radiant barriers in the attic between joists, rafters, and beams, since the attic is where most heat enters a home. Installation here, too, can be done without a professional.